Choosing the best Australian course for you can be a difficult decision. It's important to do your research and consider all the options before you make your final decision. Below is some advice to help you with your decision. Before starting your course search, it is important to have some idea of the career path you want. The first step is to choose a broader field that interests you. From there, you can think about the different careers on offer in your field and the right course to get you there. To begin the process, think about your strengths, interests and ambitions. Ask yourself: what activities am I good at? What activities do I enjoy? What are my hopes for the future? Career advisers and staff from your institution will be able to help you with this process. 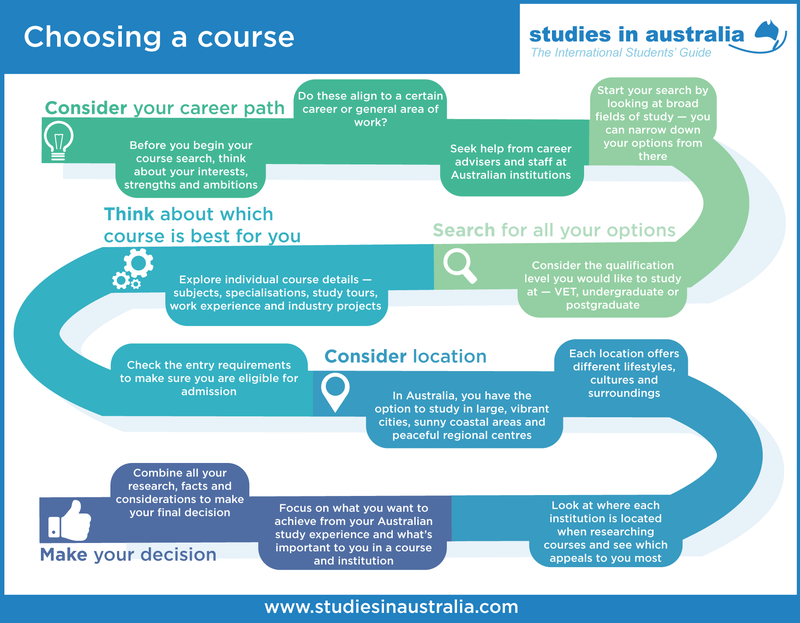 Once you have worked out the study area (or areas) you want to focus on, you can start to research the Australian courses that are available in your desired field. At this point you should be looking at the entire range of study fields that are available to you. You can use the Course Search on this website to begin your search. While some courses may have the same title, it is worth exploring individual course details. Look at the subjects and specialisations on offer within each course, as well as extra activities such as study tours, work experience and research projects. This allows you to discover which courses specialise in areas most suited to your career goals and interests. You can find contact details on this website through the Course Search. You will also need to explore the necessary entrance requirements for each course to ensure that you will be eligible for entry. Along with choosing the course that is best suited to your career goals, it is a good idea to look at the institutions that offer these courses and where they are located. Each location will offer a different lifestyle and culture, and it will be a lot easier to stay motivated and achieve in your studies if you are happy in your surroundings. In Australia you have the option of studying in large, vibrant capital cities or smaller, regional centres with a quieter and more relaxed atmosphere. You can browse the education provider websites and contact the international student offices to discover what support services and activities each institution offers. Australia is a large continent with a wide variety of cities - look at where each institution you consider is located to see which location appeals to you the most. Another point to consider is the personal support you may be able to access in Australia (such as friends and relatives already here) and whether you wish to be close to them. You can find information about different institutions and their campus locations through the Institution Search. The final step in your decision-making process is to combine all your research and consider all the facts. Try to focus on what you most want to achieve from both your study program and Australian experience. This should lead you to a final list of your preferred courses and institutions, and ensure you are ready to apply!